Once-powerful lobbyist Jack Abramoff pleaded guilty in federal court Wednesday to conspiracy and wire fraud stemming from his 2000 purchase of a gambling boat fleet. The plea by Abramoff, 46, before U.S. District Judge Paul C. Huck came a day after Abramoff entered guilty pleas to three other federal charges as part of an agreement with prosecutors requiring him to cooperate in a broad corruption investigation into members of Congress. Like a business partner did last month, Abramoff pleaded guilty Wednesday to concocting a false $23 million wire transfer making it appear the pair contributed a sizable stake of their own cash into the $147.5 million purchase of SunCruz Casinos. The plea agreement (.pdf) calls for a maximum sentence of just over seven years, but that sentence could be reduced if Abramoff cooperates fully and would run simultaneously with whatever sentence is imposed in the Washington corruption case. The remaining four counts in the Florida indictment will be dismissed. "Guilty, your honor," Abramoff said, when Huck asked how he wanted to plead. Huck sent a tentative sentencing date of March 16. 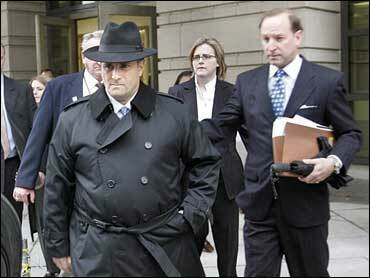 Abramoff, wearing a dark double-breasted suit and tan baseball cap, avoided a crowd of reporters and camera crews after the hearing by ducking out a courthouse side door and getting into a waiting car along with his Washington lawyer, Abbe Lowell. Abramoff has agreed to cooperate in a wide-ranging corruption probe that could involve at least a dozen members of Congress and aides, including former House Majority Leader Tom DeLay, R-Texas. lobbying process in Washington, D.C. has become (video). "Things were being done that are indefensible and where members and staff were engaged in things that I think you are going to find were clear and absolute violations of House rules," Gingrich said. Wanting to avoid any link to Abramoff, the White House said Wednesday that President Bush's re-election campaign was donating $6,000 in contributions connected to the former lobbyist to charity. The money will be donated to the American Heart Association, reports CBS News White House correspondent Mark Knoller. Abramoff raised at least $100,000 for the Bush-Cheney '04 re-election campaign, earning the honorary title "pioneer" from the campaign. But the campaign is giving up only $6,000 directly from Abramoff, his wife and one of the Indian tribes that he worked to win influence for in Washington. DeLay also joined the growing list of officials shedding political donations from Abramoff, as did his successor as House majority leader, Roy Blunt, R-Mo. ; Rep. Bob Ney, R-Ohio; and House Speaker Dennis Hastert, R-Ill.
tip the balance against Republicans (video). Lobbyist Vin Weber, once part of the House Repubican leadership, said it's up to the Republican majority to fix things — fast. "Are they going to seize this issue and become the reformers of the lobbying system, or are they going to simply sit back and let it happen to them?" Weber asked. "In which case it could cost them the control of the House." The deal comes after two years of intense federal investigation and months of negotiation with Abramoff's lawyers. The full extent of the investigation is not yet known, but Justice Department officials said Tuesday they intended to make use of the trove of e-mails and other material in Abramoff's possession. "The corruption scheme with Mr. Abramoff is very extensive and we will continue to follow it wherever it leads," said Assistant Attorney General Alice Fisher, head of the Justice Department's criminal division. The corruption Abramoff acknowledged was breathtaking in scope: bilking Indian tribes of more than $60 million, keeping nearly half of it in kickbacks. Abramoff's ex-partner in the SunCruz deal, 41-year-old Adam Kidan, pleaded guilty on Dec. 15 to two charges and faces sentencing on March 1. Abramoff and Kidan admitted using the fake wire transfer to secure $60 million in loans they used to buy SunCruz. Abramoff "will face the consequences of his actions," said U.S. Attorney R. Alexander Acosta after the plea hearing. "Frauds like that committed here are not victimless. They affect real people and impact the integrity of our financial institutions." Although both defendants in the SunCruz fraud have pleaded guilty, Acosta said the investigation remains open. He said there are links between the SunCruz purchase and some of the congressional corruption allegations, but would not elaborate. The Miami businessman who had sold SunCruz to Abramoff and Kidan, Konstantinos "Gus" Boulis, was later murdered in a mob-style hit. Three men were charged last fall and have pleaded not guilty. Both Abramoff and Kidan have denied involvement in the slaying. Abramoff won't be going to jail right away. He probably won't be sentenced for several months because he has to cooperate with the government corruption investigation. And even then, he'll probably be permitted to surrender. A copy of the eight-page plea agreement, obtained by The Associated Press before the hearing, requires that Abramoff testify before any grand jury or court proceeding that prosecutors request and provide any documents they might want. In return, the agreement says, the government will not further prosecute the defendant for anything he discloses "in debriefing sessions with attorneys and agents of the United States." Tuesday's plea agreement in Washington (.pdf) specifically mentions just one member of Congress: representative number one. Sources say he is Congressman Bob Ney, an Ohio Republican. But official Washington remains on edge, waiting for what could be another round of indictments now that Abramoff is talking. "They're all a little nervous," says Borger. "It's very edgy up there on Capitol Hill. After all, this was a very well-connected Republican lobbyist who spread an awful lot of money around town, largely to Republicans because, of course, they're the party in power, but also to Democrats." Abramoff was once a well-connected lobbyist able to command almost unimaginable fees: A Louisiana tribe once paid Scanlon and him more than $30 million over 26 months. Now facing up to 11 years in prison, Abramoff apologized after pleading guilty. "Words will not ever be able to express my sorrow and my profound regret for all my actions and mistakes," Abramoff said Tuesday. "I hope I can merit forgiveness from the Almighty and those I've wronged or caused to suffer."